Portadown-born Luke McCullough (second right) during a Northern Ireland training session this week in pursuit of EURO 2016 qualification. Pic by PressEye Ltd.
Portadown-born Luke McCullough was facing up to a scramble for EURO 2016 tickets - until an international recall put the defender back in the heart of the Northern Ireland panel for crucial games against Greece and Finland. 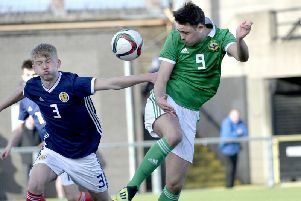 Cruciate ligament damage left McCullough ruled out of Northern Ireland’s previous Windsor Park date with destiny against Hungary and the 21-year-old took a seat in the stands to cheer on his international team-mates in the 1-1 draw. A rapid return from injury led to McCullough completing 90 minutes at club level for Doncaster Rovers on Saturday against Barnsley in League One, with that welcome appearance followed by confirmation of selection for Northern Ireland’s games against Greece (last night, Thursday) and Finland (Sunday). Michael O’Neill’s men spent this week working on a gameplan to secure the two points required for a spot at next summer’s European Championships in France. McCullough is relishing the chance to play a role in helping his country take that final step. “I was able to return for Doncaster Rovers ahead of schedule and my first priority was getting past Saturday’s game,” said McCullough. “Thankfully, I have not had any reaction to the 90 minutes and felt everything went okay. “It was great to be back at centre-back as I consider that my position but playing right-back earlier in the season with Doncaster was also a good learning experience. “The whole buzz around Northern Ireland is brilliant and I was working on a ticket for the Greece game before the call-up. “I was gutted not to be involved for the Hungary game but hopefully we can do the job now.